Smartphone has evolved from a device that was used to call and message others, now it has become a means for entertainment and you can perform almost everything through few clicks on your phone. If you don’t find time to watch television then we have compiled a list of 6 apps to watch live TV on Android without any hassle. Crackle app can be downloaded for free from the Google Playstore and can be used to watch television channels live on your android phone. 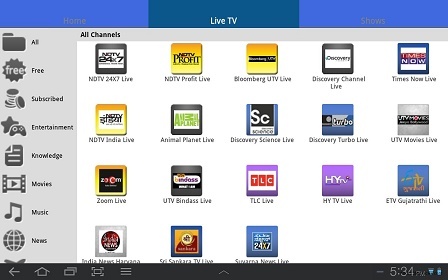 Apart from tv serials, you can also watch movies and even web shows on this app. Crackle has a customer base of more than 25 million people who use the app for watching movies and live tv on their smartphones without any cost. Crackle has bagged many awards for being one of the best entertainment apps. Popcorn Time has the simplest user interface and a vast collection of tv channels to keep you entertained. The app can be downloaded for Android devices, iOS devices and for Xbox. You don’t have to register your details or sin up to enjoy this application. So if you’re someone who does not want to pay huge bills for streaming apps every month and are looking for an alternative to such subscription based apps, Popcorn Time is what you’re looking for. The fact that services of Netflix are available in more than sixty countries of the world and it has more than sixty five million subscribers in total proves why it is the most popular streaming application on the planet. Netflix charges some subscription amount on monthly basis for letting you enjoy the services. The subscription amount is very affordable and you have the freedom to end the subscription any day of the month. SPB TV is a multi platform live TV application i.e. you can not only enjoy this app on your mobile devices, but also on your PCs. SPB Tv uses advanced technology which makes streaming very fast. This app is a subscription based application and hence you’ll have to pay some charges for accessing it. The user interface of the app is user friendly and you will not face any difficulty while searching for your favorite channel. Showbox is one of the most download movie streaming app. Users like it for the versatility of the app, showbox provides the free streaming of latest movies, TV shows and video songs. Showbox is now available only for android devices and is soon expected for iOS too. We hope that the article must have helped you if you did not want to sit in front of television to enjoy television content. Now you can watch television and keep up with your favorite movies even while travelling. Swati Sharma is an avid tech-enthusiast and geek. She writes at Bloomtimes.com where she covers topics related to gadgets, apps and operating systems.